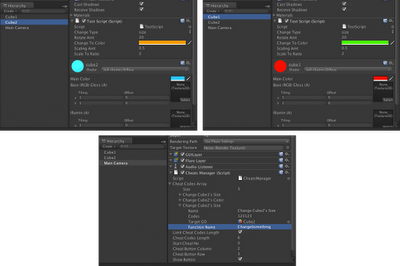 3. change some settings in your scene - spawn lesser enemies (to see if the game won't lags that much with lesser enemies, or how much it can spawn before it gets lag), reducing time.scale (to check collider errors on your player's and enemy's gameObject), etc… a lot of stuff you can do, I'm just stating some of my usage of it. 4. switch to a backup scene - for backing up, in case some unknown bugs screw up your original scene and you wanna to switch it to an extra "hidden" backup scene… Good for when developing a client's game. I know there's something called the UnityRemote 3 where you can play the game remotely using your iOS devices while syncing with your Mac. But for some reason, mine gets pretty laggy, and the graphic will also get (extremely) pixelated-like, very blurry when building 2d games. I'm not sure about the rest of you, but for mine, it happens a lot. So I got an idea of creating a "cheating system", where I could do some testing stuff while having the game running on my iOS device, with or without syncing it to the Mac. The so-called "cheating system" is actually a pretty easy thing to build. The idea is to create a bunch of invisible buttons (with number values in them) in the game scene, press those buttons (key in the codes) and it'll activate the cheats and carry out a function that does what you want. 2. 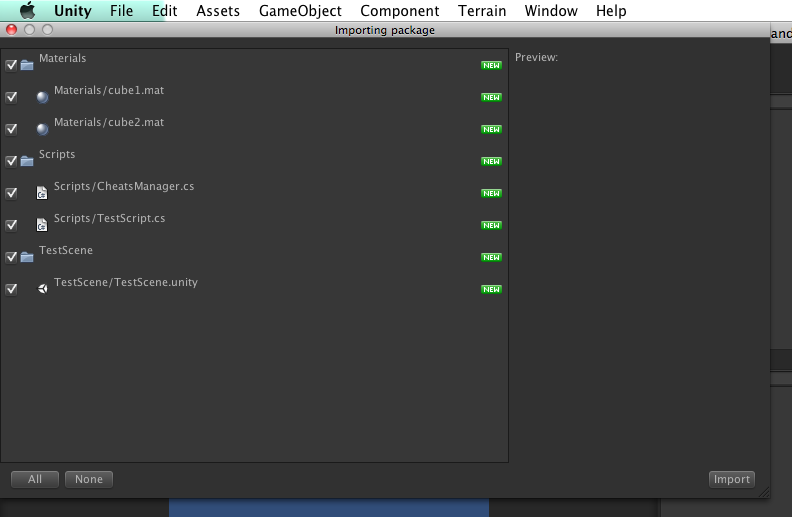 Select import and open up the TestScene. You should be able to spot two cubes lying in the middle of the screen, one red and one blue. 3. 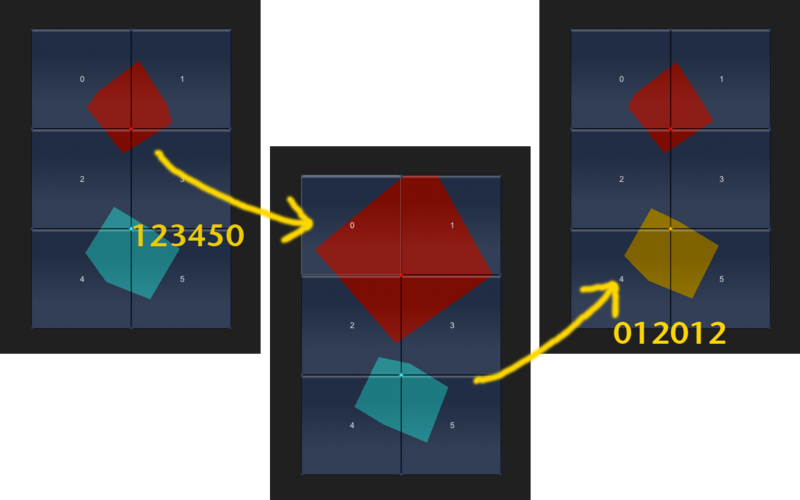 Each of those cubes are attached with a self-illumin material and a TestScript.cs script, while the MainCamera is attached with a CheatsManager script. I'll go into what each of them does a little bit later. 4. Before you click Play, check the Build Setting and make sure that your target platform is for iOS devices, and click "Switch Platform" located beside the "Player Settings" (in case you haven't), to switch the platform to iOS. 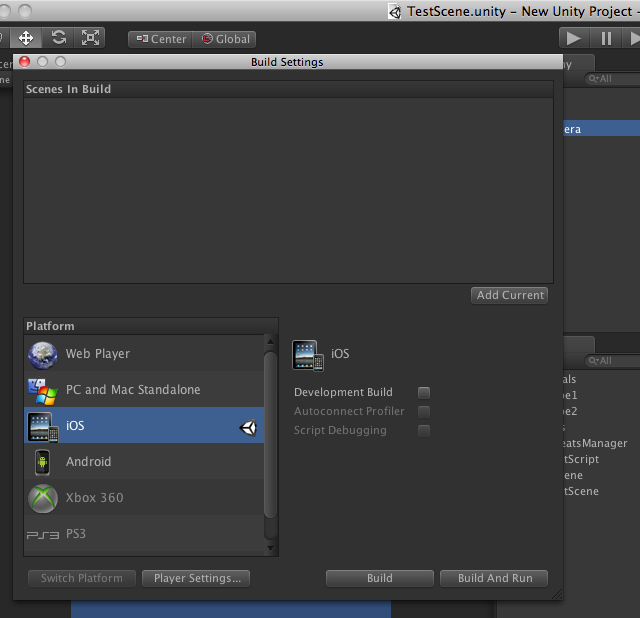 Same thing, if you're building for Android on a PC. Alternatively, you can simply change the resolution of the PC and Mac build to width: 320, height: 480, but I find switching to smartphone devices way easier as you can switch between portrait and landscape later on. 5. Once all of the above are done, go to the Game view and change the aspect to "iPhone Tall (320 x 480)", and then click Play! 6. 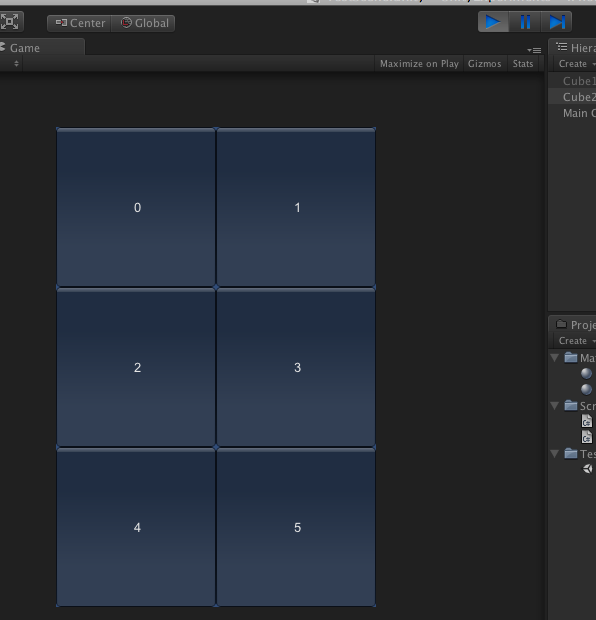 Once in the Play mode, six GUI.Buttons will be spawn on the screen. 7. For this test scene, I've already set up some cheat codes, use your mouse and click on the numbers for either of this two cheat codes: "123450" or "012012"... one at a time. 8. 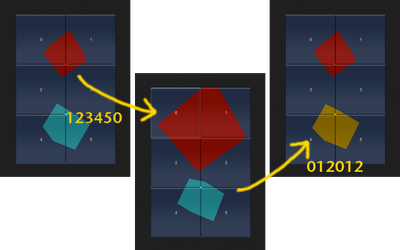 If you succeeded in clicking "123450", the red cube above will enlarge, click the same codes again and it'll shrink back to its original size; while if you clicked on "012012", the blue cube below will Color.Lerp to another color, click the same codes again will change it back to its original color. 9. Now let me explain the "magic" behind this. 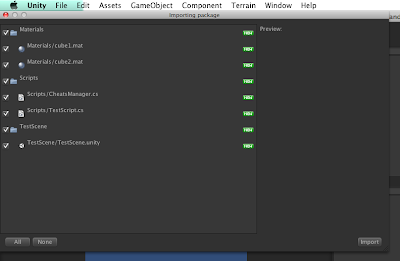 Click on the Main Camera, and you should be able to find a CheatsManager script attached to it, in the inspector. = Function Name, the name of the function that the targetGO contains in its script. 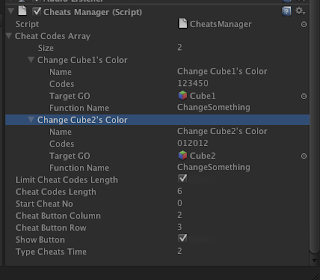 checking this to true, will limits the length of cheat codes to the amount of cheatCodesLength variable (below). 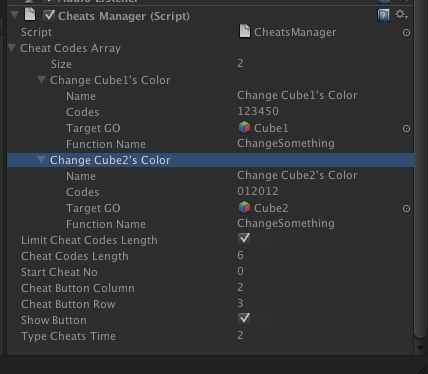 the maximum length of cheat codes (the subsequent cheat codes you had in the Cheat Codes Array's Codes variable must also be at the size of this variable). the starting cheat button number, default at 0. Decides what number will the cheat buttons start with. 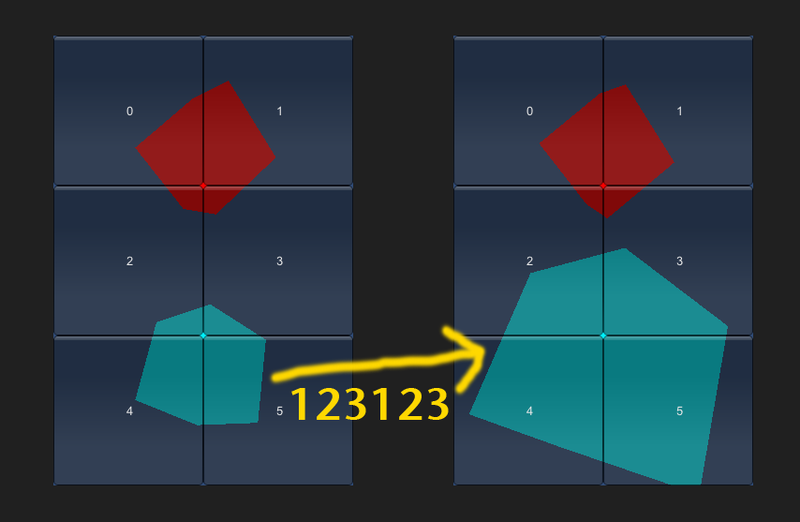 If leaves it at default, the button sequence will be "012345" (depends on the number of buttons); setting it to "1" will change the sequence to "123456". the number of columns cheat buttons have. the number of rows cheat buttons have. 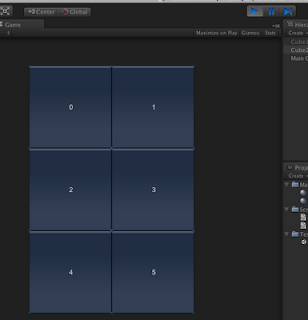 By multiplying the amount of column and row, you'll get the number of buttons which will be spawn in the scene when game starts. checking this to true, will shows the GUI.Buttons on the screen in Play mode; while at false, it won't, but still press-able. It's only replaced with a blank GUIStyle that makes the buttons invisible. how long you can type the cheat codes before it resets, defaulted at 2, means when you stop typing the codes, it'll take 2 seconds to reset everything so that you can type again. 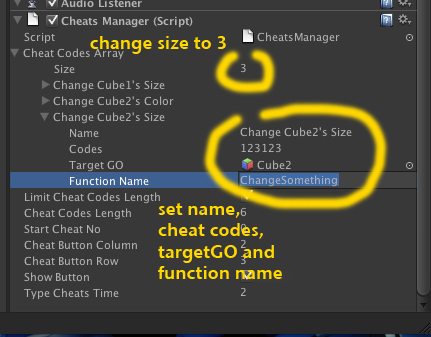 Assuming you wanna to change the size of the blue cube, and blue cube has a script inside it which contains a function called "ChangeSomething" which does all that. i. All you have to do is to click on the blue cube, look for a variable in its TestScript.cs called the "changeType", change the value from "color" to "size". ii. 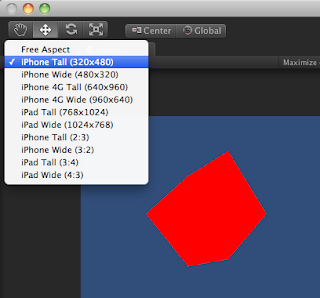 Then click on the Main Camera again, and change the size of the CheatCodesArray to 3. 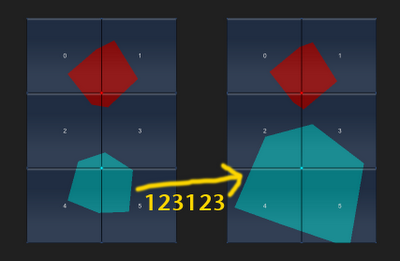 Name it to "Change Cube2's Size" (optional), then randomly write a cheat codes at the length of 6 (I'm using "123123"). iii. 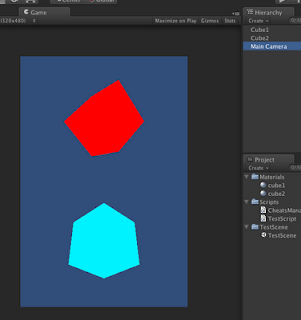 Drag the blue cube gameObject from the Hierarchy to the Target GO variable, then change the function name to the name of the function you want to call, which in this case, is "ChangeSomething"... insert that in. iv. 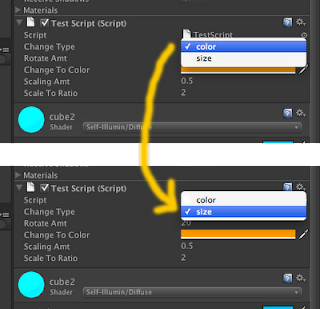 When the game is in Play mode, and the desired cheat codes is pressed in, it'll call the function that change the size of the blue cube from within the CheatsManager script, using SendMessage(). And then the blue cube will start changing size. If it works, then congrats, you've just made a successful cheats! But if it doesn't, please go through the sample exercise again. Feel free to test around with the variables value in the inspector if you like, but don't mess around with the CheatsManager scripts unless if you know what you're doing. Again, if you wanna to create an entirely new gameObject with an entirely new script, you just have to create a new space in the CheatCodesArray, set new cheat codes, drag in the gameObject to Target GO and then set the function name.